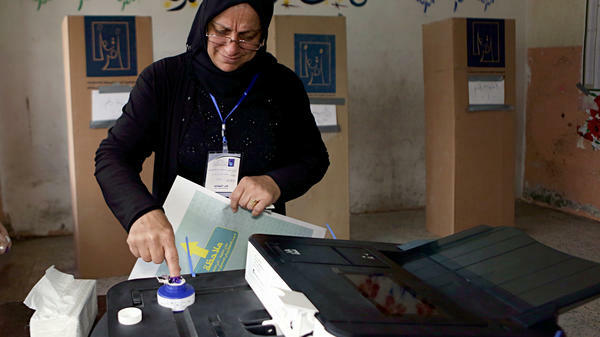 An Iraqi woman casts her vote in the country's parliamentary elections in Baghdad on Saturday. "It's very little. Most of the people who came to vote are the elderly and women," said Khaled Abdul Satar Jabar, the head of a polling station in the Iraqi Shiite neighborhood of Kathamiya. "In the past there were long lines of voters — people came in groups. Now they come as individuals." Jabar, 40 and a university professor, said he believed a lot of young Iraqis were staying away from the polls because they'd been disappointed by past politicians who have made Iraq one of the most corrupt countries in the world. The polling center was a primary school with battered desks and stained walls. An orange and white cat dragging a broken leg wandered through the cardboard voting booths. "Young men feel there's no change," said Jabar. "Most of these candidates mock people with their corruption." There was little of the euphoria that characterized past elections in Iraq, even in the height of violence in Iraq. Fifteen years after Saddam Hussein was toppled, voters dipping their fingers in purple ink to show they have cast their ballots has become routine. In Baghdad there were fewer parents bringing their children to the polls. Twenty-four million Iraqis were eligible to vote — about 3 million of them who turned 18 since the last election in 2014 and could vote for the first time. By late morning, with no major security problems, Prime Minister Haider al-Abadi lifted a general vehicle ban imposed while voting was taking place. The ban on vehicles, meant to prevent car bombs, was left to the discretion of local security commanders. At another polling center in Baghdad's central Karrada neighborhood where media were allowed to enter, journalists far outnumbered voters. One voter, a retired transport ministry employee, said this election seemed to be more organized than those in the past. "The terrorists are almost gone, and you can be free to vote," said Mohammad Fadel al-Zubaidi. He said he was voting for a different political list this time, one that promised change. "We have bad people in government. If they stay, we will have the same situation. We need to get rid of them to bring new faces, more educated and more democratic people," he said. Iraq consistently ranks as one of the most corrupt countries in the world. Despite its oil wealth, about 20 percent of Iraqis under 30 are unemployed. Just after the polls opened, residents and some police were in the streets scavenging campaign posters set on large metal frames — taking away the steel to reuse and throwing away the posters. Abadi is running for re-election on a platform based on the country's victory in defeating ISIS. He has pledged his next battle would be to fight corruption and create jobs. Abadi, though, faces more challengers in this election. Since the last parliamentary elections four years ago, Iraq's Popular Mobilization Forces, many of them Iranian-backed former militias, have become a major factor in Iraqi politics. One of their leaders, Hadi al-Amiri, is Abadi's main rival. Former Prime Minister Nouri al-Maliki, from the same Shiite Dawa party as Abadi, is also running. As the polls closed, Ahmed Hamed Shaker, a follower of Shiite cleric Muqtada al-Sadr, cheerfully loaded crumpled campaign posters into a sanitation truck. He voted earlier in the day. "Normal citizens are demanding their rights, electricity, clean water, jobs," said Shaker. "We don't care about which religious sect you're from — the important thing is to raise the name and the voice of Iraq."